Jacob Bridgeman holes the winning putt on the second playoff hole to claim the Spartanburg County High School Championship. The top of the leader board at the Spartanburg County High School championship looked like the leader board at just about any South Carolina Junior Golf Association major championship. The tournament field included the top-two players and seven of the top 12 players in the Heritage Foundation Junior Player Rankings. 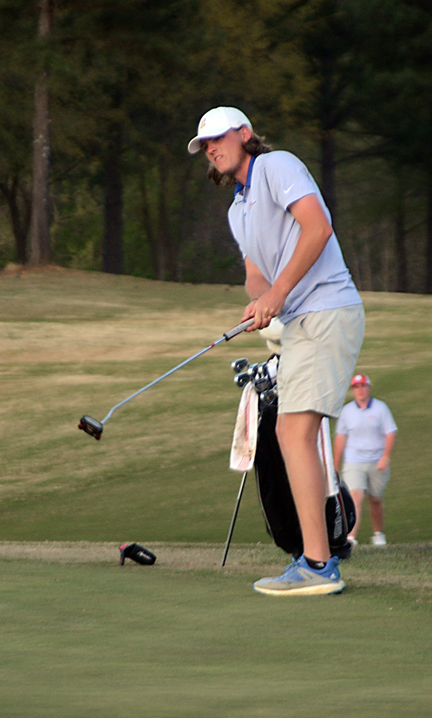 The individual championship came down to a playoff between Jacob Bridgeman of Chapman and Reed Bentley of Byrnes. The two golfers finished regulation with outstanding rounds of 5-under par 67 to force the playoff. On the second playoff hole Bridgeman landed a pitching wedge just two feet from the pin. Bentley also hit a good shot that ended up on the edge of the green. 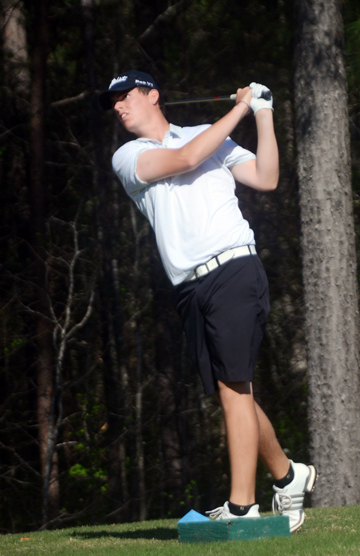 Reed Bentley of Byrnes shot a 5-under 67 and finished as the runner-up in the Spartanburg County Championship. Bentley made a fine run at a birdie, but his 35 foot putt just missed the hole. Bridgeman only needed to tap in his two-foot birdie to win his first county championship. 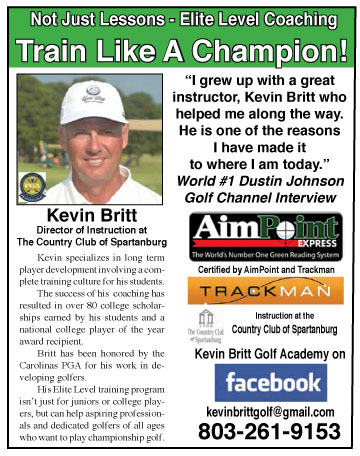 “I made a lot of putts today and played pretty well,” said the new Spartanburg County champion. “I had six birdies and only one bogey in regulation and in the playoff I hit it close on both holes,” he said. Bridgeman along with fellow Woodfin Ridge golfers, Trent Phillips and Harrison Corbin have been at the top of the junior rankings for much of the past two years. The three compete with each other and practice together and know how good the top players in the field can play. “This is a nice win because we have a lot of good players in the county. I’m glad to get the win,” said the future Clemson golfer. In the battle for the team title the Gaffney Indians won their first County title with a victory over Byrnes and the defending state AAAAA champions from Boiling Springs. Future Clemson golfer Zack Gordon shot a 5-under 31 on the back nine to help Gaffney win the Spartanburg County Championship. 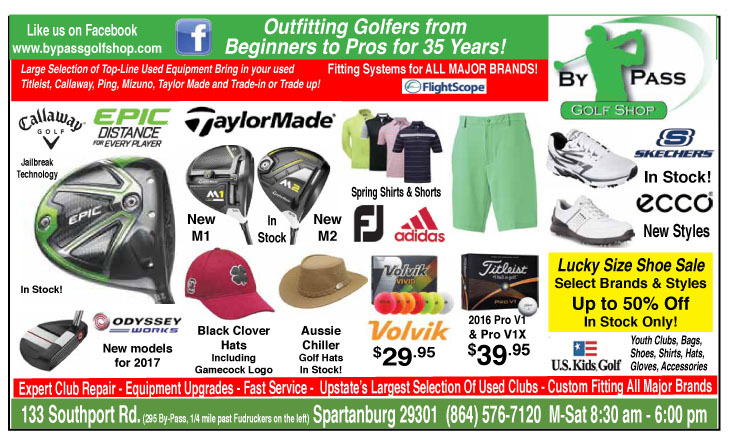 “This is the first time we have come into Boiling Springs backyard (Woodfin Ridge Golf Club in Boiling Springs) and been able to beat the Bulldogs,” said Gaffney coach Brandin Coggins. 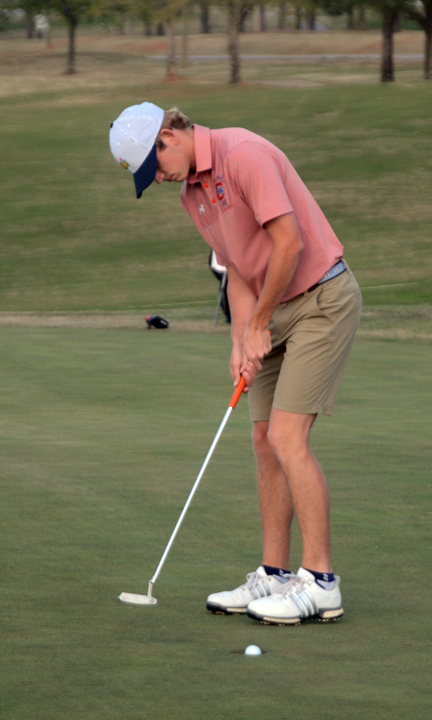 “Zack Gordon and Seth Taylor blitzed the back nine and that was why won,” said the Indians coach. Gordon shot a 5-under par 31 and Taylor carded a 4-under par 32 to go along with the rest of the team to finish with a 289 total. 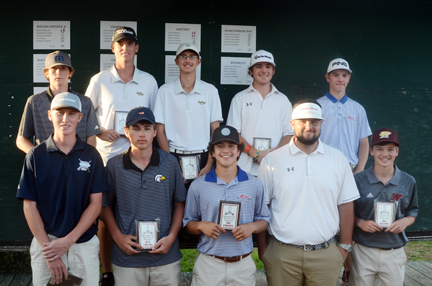 Byrnes had a trio of players make the All-County team, Bentley, Tyler Jones and Will Brooks, helped the Rebels to the runner-up finish. Boiling Springs finished third, 11 shots behind the winners. Trent Phillips and Harrison Corbin made the All-Spartanburg County team from the Bulldogs. 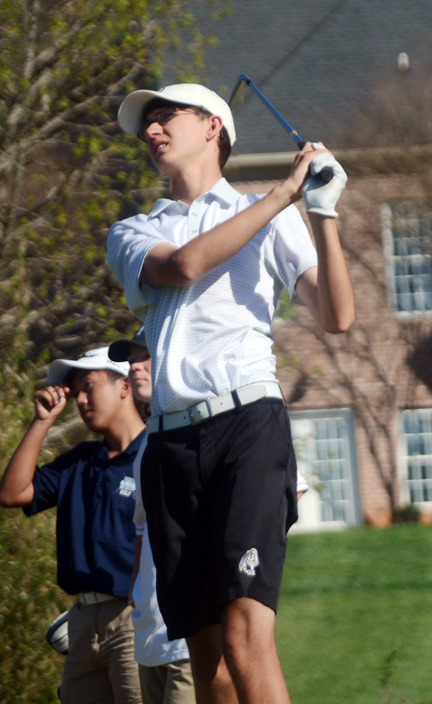 Chesnee led by Garrett Cooper and Spencer Addley finished in a fourth place tie with Dorman. The Cavaliers George Eubanks, Jr. also earned All-County honors. Gaffney finished as the runner-up to Boiling Springs at last year’s AAAA state championship. The Indians have set as a season goal to reverse the order of finish at this year’s state championship in Summerville. Seth Taylor shot a 4-under 32 on the back nine to help Gaffney win their first Spartanburg County Amateur team title. “Our team has come a long way in the last couple of years. I think the difference for us this year is that our players have all played in some high level competition outside the high school season. They know what it is like to play in big tournaments and against top players,” said Coggins. Meanwhile the defending champions are playing well, but Coach Josh Pruitt knows they are going to have to play better if they want to win their fourth state title in a row. “The hard part is keeping the kids motivated. They have had success and know they are a good team,” he said. “I am certain when the time comes they will be ready to defend the title,” Pruitt said. The AAAAA state championship will be played in Summerville this year instead of Furman. 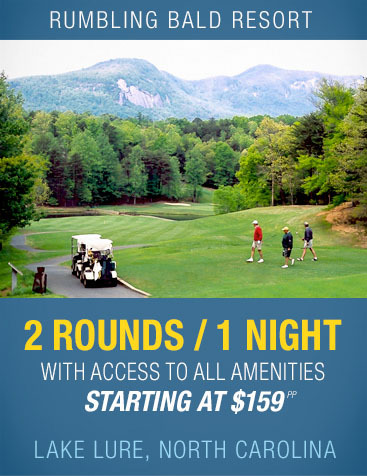 Wescott Plantation will host the 54 hole state championship starting on Monday,May 15th. The Spartanburg All County team included, Zack Gordon and Seth Taylor from Gaffney, George Eubank, Jr.fromDorman, Reed Bentley, Tyler Jones and Will Brooks from Byrnes, Garrett Cooper and Spencer Addley of Chesnee, Trent Phillips and Harrison Corbin of Boiling Springs and Daniel Brassington of Woodruff. 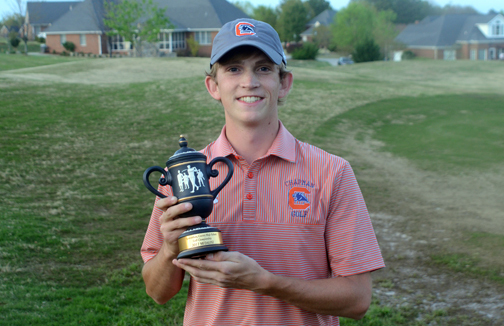 Jacob Bridgeman of Chapman shot a 5-under par 67 and then won a two-hole playoff for the Spartanburg County individual title.